The Lobby Dustpan Set received two nominations in the prestigious competition. Remco has been working with the food industry for over 30 years and their long-standing strategic partnerships uniquely position them to provide products that meet the industry’s changing needs. It’s this knowledge that led to past innovations like their hygienic polypropylene shovels, stainless steel scrapers and condensation squeegees. 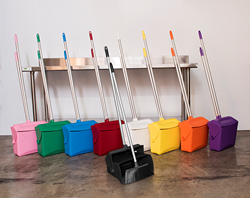 Remco’s Color-Coded Lobby Dustpan Set is a durable, ergonomic, and FDA-compliant alternative to standard broom sets. The dustpan has no hard edges or witness lines that could trap food residue or bacteria and can be easily disassembled and reassembled for regular washing and sanitizing. The large, 7x14 inch bin allows for big and small cleanup jobs, while the tall, 37-inch handle alleviates back pain that stems for leaning over shorter dustpans. The lobby dustpan was created with food processors and food service workers in mind. More features, benefits, and specifications. Remco provides color-coded tools for cleaning and material handling where hygiene and safety are critical. The introduction of a food-safe poly shovel more than 30 years ago established Remco as an industry pioneer of hygienic design. In addition to its hygienic shovels, scoops, and scrapers, Remco features Vikan’s advanced line of brushes, brooms, and squeegees. Together with Vikan, Remco supports color-coding plans by offering more tools in more colors than any other supplier. Remco also provides training and support to end users, helping ensure regulatory compliance. Regardless of an operation’s size or complexity, Remco has the tools and expertise to help execute HACCP color-coding plans.